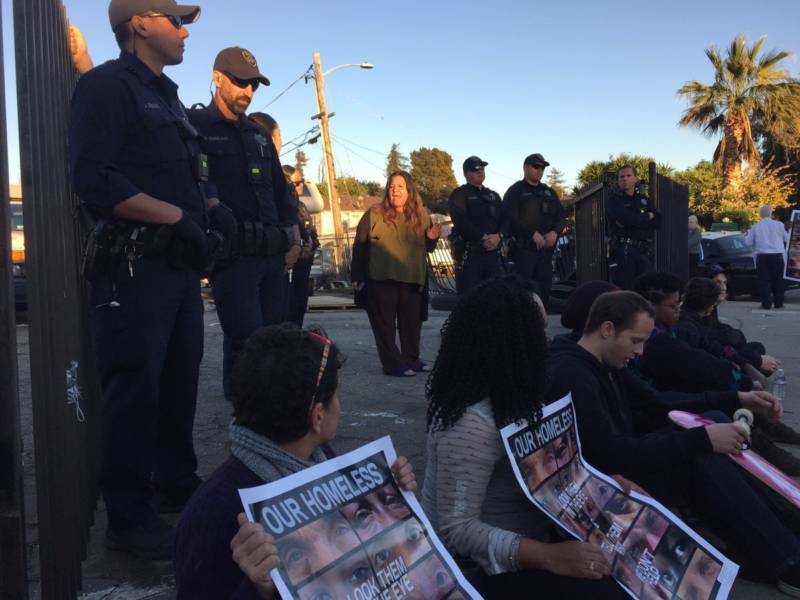 Oakland city crews evicted a female-led homeless encampment in the Brookfield Village neighborhood of East Oakland Thursday, after residents said they had negotiated with the city to allow them to stay the day prior. 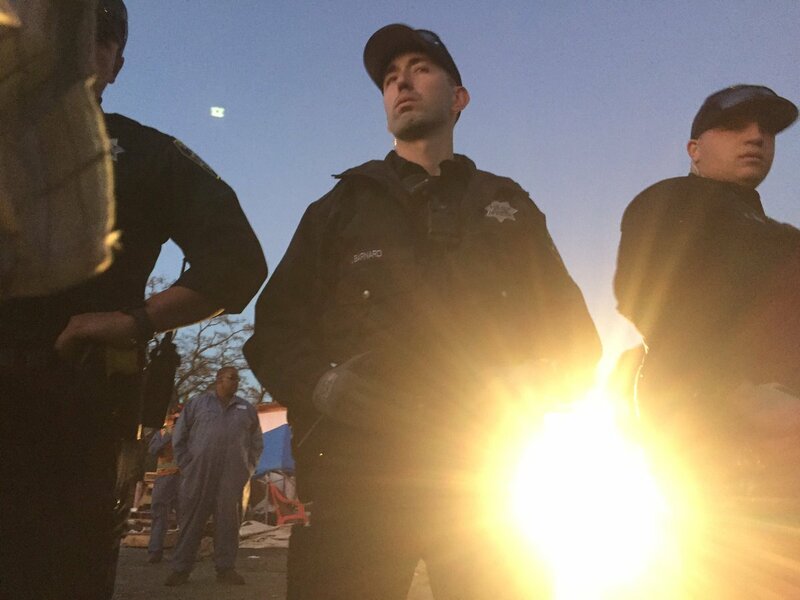 Police broke chains that locked the encampment's fences together, and the city Department of Public Works began clearing out the residents' belongings in trucks Thursday afternoon. Twenty to 30 protesters gathered to defend the encampment Thursday, in comparison to a larger crowd of about 50 on Wednesday. Residents like encampment leader Anita de Asis, who goes by the name Needa Bee, questioned the timing of the eviction. "Why did they come after the protesters and the media were gone," Bee asked. "While the children were at school, while half of the residents were at their job, they came in and swarmed us. They did not allow us to pack," Bee said. And when supporters did show up "they didn't allow supporters in to help us pack." The residents' personal belongings will be stored for 90 days, according to a statement from the city. The statement says residents have been informed on how to retrieve their possessions, and that it will post signs with directions on how to do so once the clean-up is complete. "The city promised that they would negotiate with us," said Bee. "We believed they would, but I'm not surprised that they came to evict us today." In a statement on Wednesday, the city administrator's spokesperson Karen Boyd did not confirm a promise to negotiate. She wrote, "the advocates have asked for a meeting with city officials. City officials were working on setting the meeting up, according to Boyd. That meeting, Bee said, never happened. Bee planned to take her camper and find somewhere else for her and her daughters to sleep tonight. She won't be going to a shelter because they do not meet her needs. Candice Elder, a community activist with The East Oakland Collective who supports the residents, said that specific rules make it impossible for some to use the shelter beds. "Half of the residents here can not even go into the shelter because of their unique circumstances. They have pets, the have minors, they work at night." But Elder said it is about more than shelter restrictions, "a shelter is not a home, this was home. This was the only, only, safe curbside community for single women," she said. "The city fulfilled its obligation to offer residents shelter and took a compassionate, careful approach to match residents with their specific shelter needs," the city's statement said. But residents like Needa Bee said they don't understand why the city would not let them stay on the parcel, which has sat empty for decades. As police stood off against protesters, they chanted "homelessness is not a crime." "Look at these garbage trucks, these are the moving trucks for the homeless people that the city uses. Garbage trucks," said Andrea Henson, a homeless advocate who left work to stand with the residents. One protester was briefly detained and released on-site, police said. Armed with coffee and pastries, a small group of homeless advocates gathered early Wednesday morning in front of a female-led homeless encampment in the Brookfield Village neighborhood of deep East Oakland. They'd come to protest the city's scheduled eviction of the encampment's 13 inhabitants, a female-led group living on this city-owned empty lot for more than a month, a site they named the Housing and Dignity Village. By late midmorning, as rain came in fits and starts, the group had grown to about 50 people, while the residents they'd come to support stood watch behind the site's locked gate. The makeshift site, which residents describe as a safe, drug-fee community, is a collection of trailers and orderly tents set up alongside a composting toilet and larger communal tent. Residents have access to food and some medical services and are protected by a large iron fence. But Oakland officials argue that inhabitants broke into the fenced-off area and have been illegally occupying a site for which the city is ultimately liable. The city's first attempt to evict residents of the encampment was blocked in early November when a federal judge granted a temporary restraining order. But last week, the same judge ruled that as long as the city could provide residents with alternate shelter options, it could legally evict them. "It's a little disappointing that we are here the morning of the eviction, and shelter hasn't been set up or sorted out for the residents," said Joshua Piovia-Scott, an attorney representing the homeless group. "Because that is exactly what the judge had ordered to happen." But Karen Boyd, a spokeswoman for the city administrator's office, denied this claim. In a statement, she said that city staff have been on-site, engaging with residents to determine their specific shelter needs, and providing compassionate options. The city "has offered the residents every opportunity for shelter," Boyd said. But residents said that shelter options offered by the city are insufficient. Some shelters, they said, don't allow children or pets -- a claim the city denies -- or don't accommodate people who work at night. Residents also worried that a promise of a shelter bed might last only for a day, even as city staff have "reassured them that they are able to stay for more than one night," Boyd said. But a few hours after the scheduled eviction, police and city officials left and Candice Elder, a homeless advocate, addressed the remaining crowd of supporters. "We negotiated with the city to not evict today," Elder said, to a round of cheers and applause. The city had promised to "sit down with the 13 residents and hear their stories, and negotiate a better process," she said, emphasizing that should have been the plan from the start. "You don't do case management three days before you evict someone," she said. "You don't do case management after you serve an eviction notice. You're supposed to sit down with these folks and treat them with respect and dignity way before this. So we got them to do this now." The leader of the encampment, Anita de Asis, who goes by the name Needa Bee, said staying on the land is her goal, no matter the unlikelihood of the city agreeing to that. "Why move us if we're actually improving the situation not just for ourselves, but for the surrounding community," she said, adding that the community fed 500 people on Thanksgiving. "There's hundreds of people in this neighborhood who are homeless that use our services." Before they took over and cleaned up the lot, Bee said, it was full of trash, drug paraphernalia and human feces. She pointed out the compostable toilet and community garden, noting that residents have taken pride in this encampment. Village resident Ayana Johnson took a moment to thank the supporters who had stayed. "I really appreciate it from the bottom of my heart," she said. "If the whole city did this, we wouldn't be fighting about some little land. We'd all have something."